Lara’s work comprises a network of interrelated approaches and efforts in which she assumes the multiple and shifting positions of researcher, artist/designer and teacher. 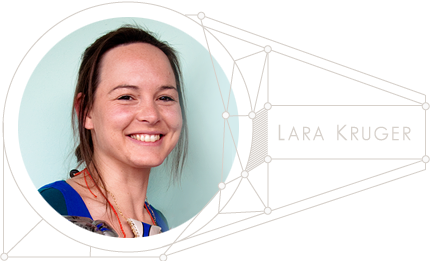 In addition to taking part in various group art exhibitions, Lara has participated in collaborative projects and community orientated work since her undergraduate years as a University of Stellenbosch Fine Arts student. Following her graduation in 2003 she discovered a passion for and developed sound skills in teaching and facilitation as an Art and Design teacher and as a facilitator of creative processes outside of the formal education realm. As a New Love Foundation board member and art facilitator she collaboratively developed and executed arts-based participatory educational programs such as 16 Days of Activism programmes (2009) in Atlantis, Western Cape and the ABSA Klein Karoo National Arts Festival (KKNK) 2010 Klap! (KKNK Schools programme) Workshop. Knitted Cosy for a Rhino (2009) was a performative, public intervention process that Lara led in collaboration with residents from Safe House, a home for abused women and children in Stellenbosch, in which the participants all contributed towards knitting a “cosy” from shredded plastic shopping bags for a life-size rhinoceros sculpture. During 2009 Lara was invited to and attended the 11th International Weimar Summer Programme under the direction of Shelley Sacks and Hildegard Kurt in Weimar, Germany. During the course and workshop process Lara explored Social Sculpture in relation to earlier experiments in Weimar that were investigating and renegotiating the relationship between life and art. During 2010-2011 Lara collaborated with various individuals and groups in guiding the environmental arts multiple-genre social learning project titled COPART (Connecting Our Planet and Re-Imagining Together) movement, for which she participated and facilitated in events such as the Climate Fluency Exchange (2010) and the Re-Imagining Creative Practice in Sustainability event at the National Arts Festival (2011). In 2012 Lara obtained a master’s degree in Visual Art at Stellenbosch University. During her M.A. research she explored the possibilities for how one might work aesthetically to contribute to the enabling of a human ecology through connection-making between individuals and groups, people and planet. As a mother and high school art and design teacher, she currently finds herself working from a felt need to create aesthetic learning and living spaces in her own home and at the school where she teaches. It is in these situations where she feels compelled to work with questions related to how aesthetic experience might assist us in becoming mindful creators of ourselves and our surroundings. For Lara, the tangible objects that we create (such as SKOP’s products) and the invisible (social) shapes and connections that we create in our every day lives, are intricately interwoven. When creating design objects, Lara’s often very time-consuming techniques change from project to project. Intense labour and repetitiveness are recurrent characteristics of her work. Her finished pieces are largely a result of ideas found intuitively in the process of reworking the material. In an up-cycle challenge such as with SKOP the transformative potential of the material and shapes become metaphors for other transformations. The soccer balls and the patch units they are made of become nodes in a greater map of social and environmental connections that are picked apart and re-stitched to create beautiful forms.